Bible Cartoons: Maps for Bible Cartoons go live! Maps for Bible Cartoons go live! The new Maps for Bible Cartoons pages have gone live – hurray! I’ve been drawing Bible-based maps for a few months now and wanted to make them available for view and for purchase. I made them pretty functional but not very fun to look at! So I have re-vamping their design, to include little figures around the edges, little pictures of animals, & other elements that will hopefully make people smile when they see them. 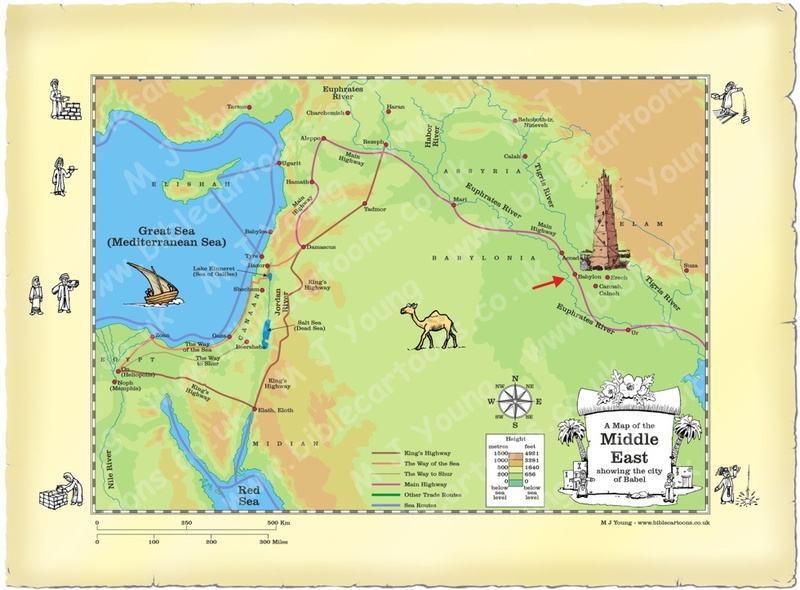 Notice on the map below that I have include a little picture of the tower of Babel. I want to make my maps interesting and fun with little details like that on some of them. I draw maps to help people find out where places are that are mentioned in the Bible. There are lots of quite obscure towns, cities & other places mentioned, which are hard to find, hence the maps I draw. I hope they will help people to identify where a certain place is, and so help them engage more with the Bible. There are 4 pages that display the maps (they’re the same maps, just ordered on the pages differently!) based on preference. I hope this will help viewers to find a map they are looking for easily. In this version Maps are broadly grouped by Old and New Testament, then in Bible book order within each book. Here you can see all Large scale Middle East maps grouped together, then all the maps relating to Northern, Central and Southern Israel, then other regions. You get little thumbnail images on that page (not on the others). maps are ordered according to Bible Book order, e.g. Map(s) in Genesis first, then map(s) in Exodus, all the way up to Revelation… although I haven’t got any maps in that book…yet!